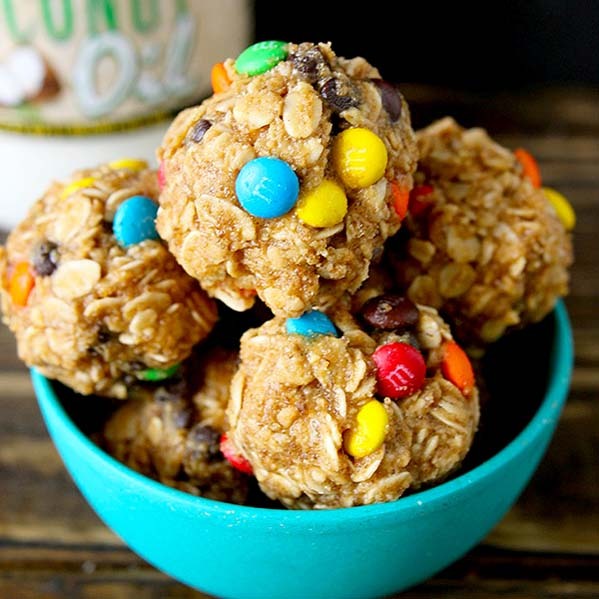 These Peanut Butter Oatmeal Balls are easy, delicious, and the perfect snack! Made in just a couple minutes and no baking involved. 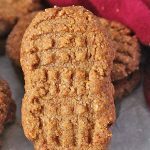 Bite-size, easy to make, and everyone will love them! 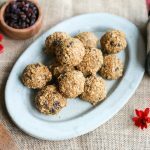 I make treats for church every week and sometimes it’s cookies and bread, and other times it’s easy no-bake treats like these peanut butter oatmeal balls. They come together so quickly, I always have all the ingredients on hand, and everyone loves them. They are my go-to when I don’t have much time or if I don’t feel like baking. A great thing about these is that they are customizable! 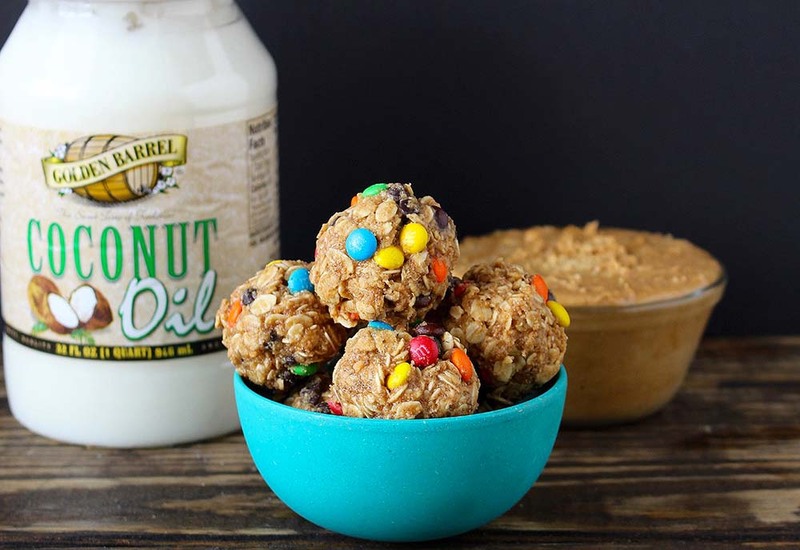 Leave out the M&M’s and they’re vegan, switch out the peanut butter for sunflower butter to make them nut free, or replace some of the oatmeal with shredded coconut for added texture. As long as you use gluten free oats, they are gluten free as well. There are so many things you can do with these. 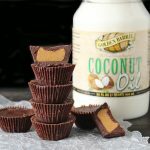 Using Golden Barrel Coconut Oil keeps these little bites of deliciousness dairy free and their Organic Brown Sugar gives them just the right amount of sweetness. They aren’t overly sweet, but still a treat. The sweetness is balanced perfectly with the salty peanut butter, chewy oats, and crunchy chocolate chips. Hand-held little bites that are great for snacking! These are best kept in the fridge. There isn’t anything in them that can go bad, but they set up nicely in there and I find that they keep their shape better. They don’t get too soft at room temperature though, so they are still good to pack in lunches or as a road trip snack. 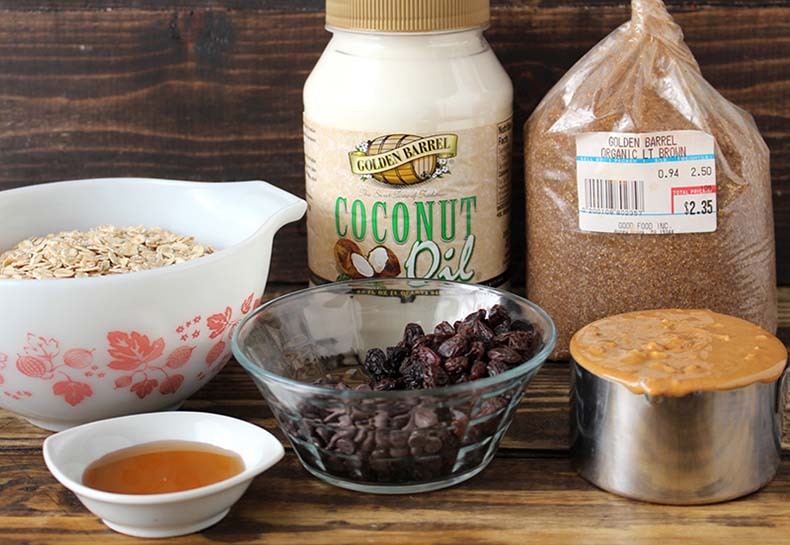 Here are the ingredients you’ll need: oats, Golden Barrel Coconut Oil, Golden Barrel Organic Light Brown Sugar, maple syrup, chocolate chips, raisins or M&M’s, and peanut butter. I use crunchy all natural, but you can use whatever your favorite type is. 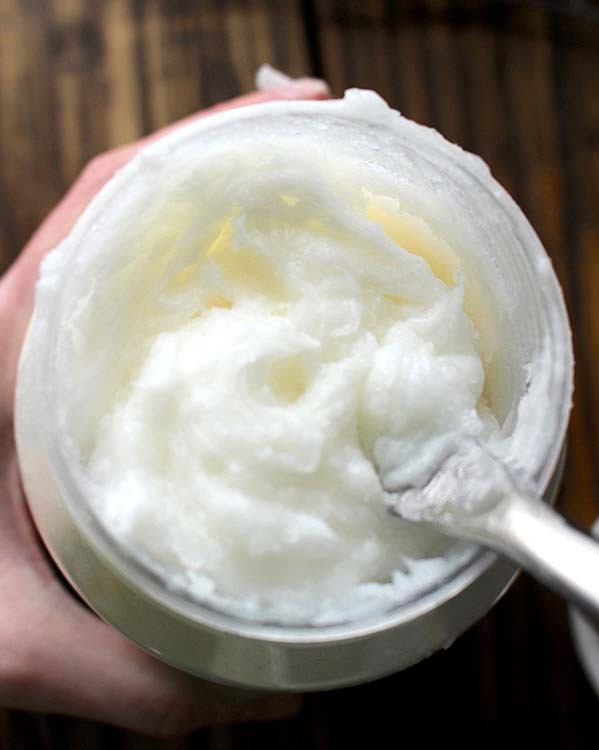 The coconut oil needs to be soft, but not melted. I gave mine a good stir until it was soft and smooth. 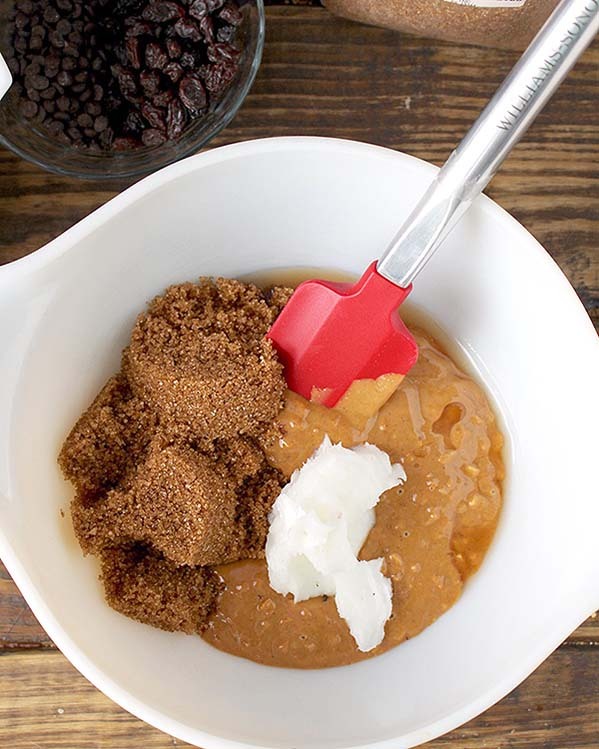 Combine the peanut butter, coconut oil, brown sugar, and maple syrup in a large bowl. Stir to combine. There shouldn’t be any clumps of coconut oil or peanut butter. 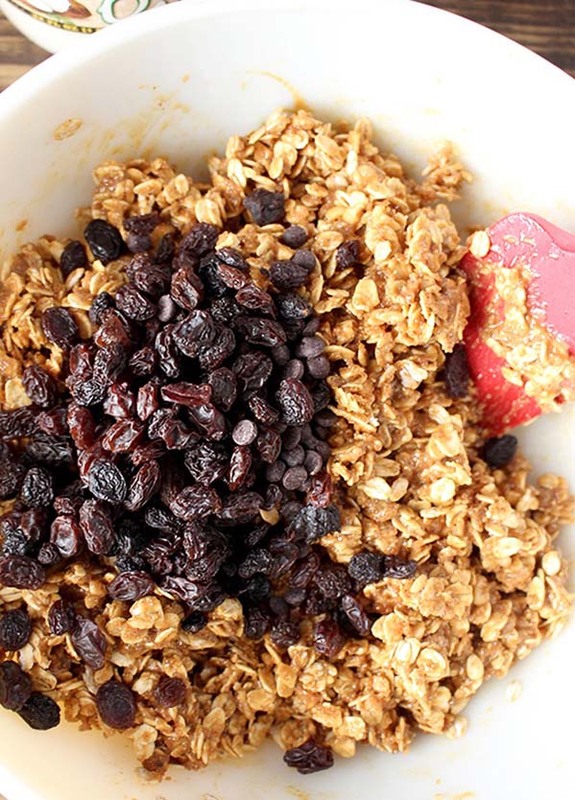 Add the oats, then the chocolate chips and raisins or M&M’s. Stir until evenly mixed. Scoop into small balls and place each ball in the palm of your hand and squeeze tight. This will help pack the ball and keep the ingredients together. Place them on the wax paper. Store in the fridge or eat immediately. You will love how simple, quick, and delicious these are! 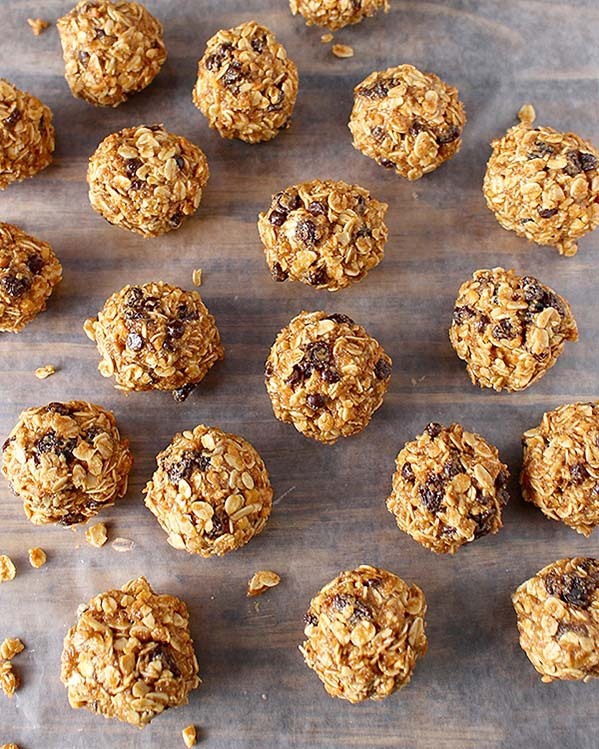 Make a batch now and snack on them all week. Place a piece of wax paper on the counter or in a container that you will store the peanut butter balls in. 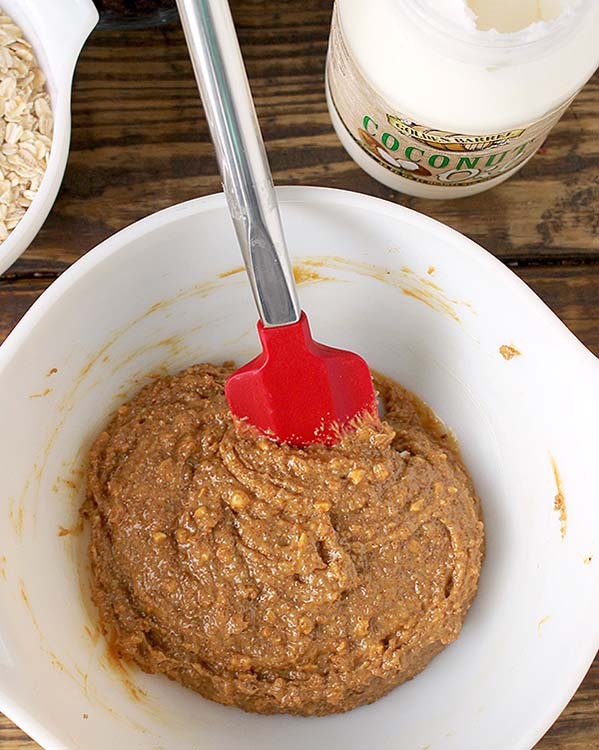 In a large bowl, combine peanut butter, coconut oil, brown sugar and maple syrup. Stir until smooth. Add the chocolate chips and either the raisins or M&M’s. Stir well and scoop into balls. Place each ball in the palm of your hand and squeeze tight. This helps pack the ball and hold all the ingredients together. Place on the wax paper and continue scooping until all mixture is rolled. 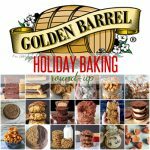 As soon as I read through this recipe, I started my own batch. They’re currently hardening up in the fridge! They look amazing!! Thanks, Kat! I hope you and the boys love them! Hi Lora! You can use room temperature butter in place of the coconut oil if you need to. I hope you enjoy them! Is there anything you can use to replace the brown sugar? Hi Bianca- you could use coconut sugar which would be the same amount. You can try honey or maple syrup but then you’ll have to adjust the dry ingredients to make up for the extra moisture. The nice thing about these though is that they’re no-bake, so you can just add until you get the consistency you want. I hope that answers your question and you try them! That sounds great! Thanks for trying them, Trish! So glad you like them! Silly question…… My mixture is pretty moist. Should I just add some more oats and brown sugar? Hi Katie- yes, feel free to add more oats until they are thick enough to roll in balls. Hope you love them!